Back when I was in college I tried shrimp pizza for the first time. All I remember about that pizza was that it was a traditional red sauce pizza with shrimp and that I liked it. It was also the last time that I ate pizza with shrimp on it; until now. That pizza has always been in the back of mind, knowing that someday I would have to try my hand at making a shrimp pizza. Well I am happy to say that I finally got around to making one. 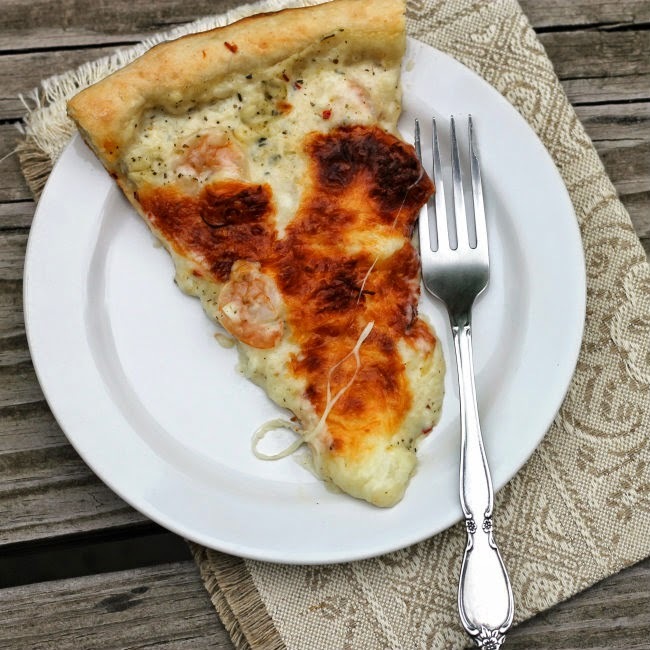 I decided to change out the red sauce for a garlic white sauce; I have been playing around with a garlic white sauce for different dishes and thought it would be a yummy way to go with this pizza. 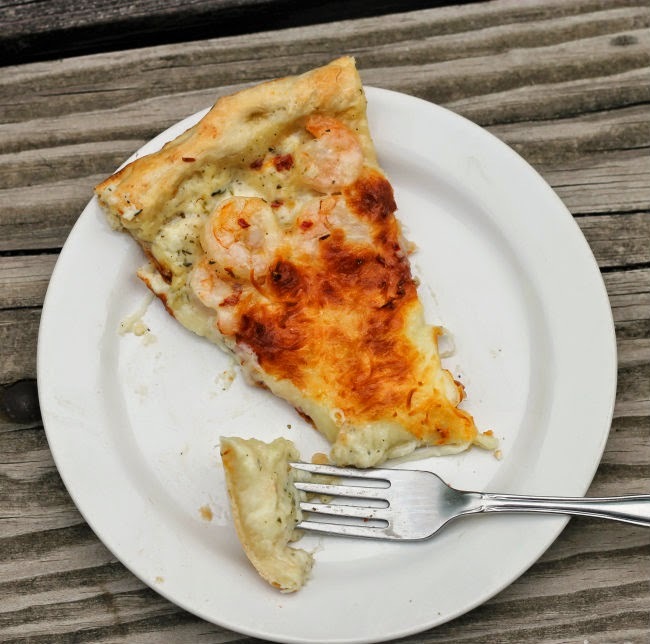 Garlic, Parmesan cheese, shrimp, and a lot of mozzarella turns out to be one delicious pizza. There is no doubt that I love pizza with a red sauce too, but I love this garlic sauce for something different. I have made chicken pizza with a sauce similar to this one and it is oh so good too. What is your favorite sauce on a pizza? 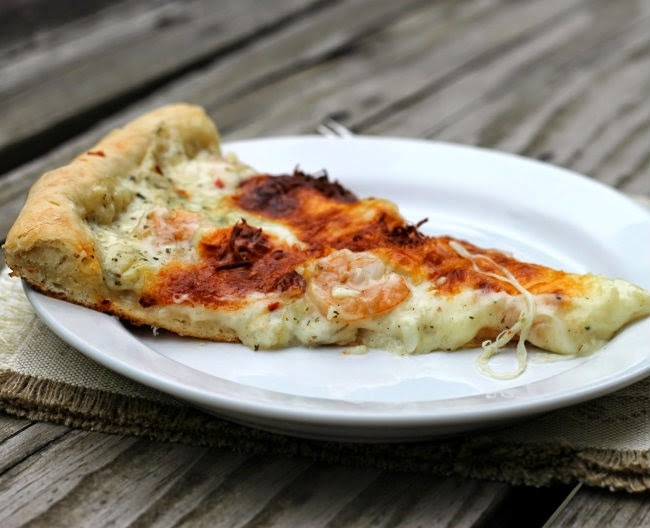 For that matter what is your favorite toppings… have you tried shrimp on pizza yet? If not give it a try… you won’t be sorry that you did. 1. Melt butter in a skillet add the garlic and the onion. Saute for a couple of minutes and stir in the flour. After adding the flour stir continuously until the flour is mix in well with the butter and it has become thick. 2. Add the milk to the butter and flour mix until well blended. Add the Italian seasoning and blended. Continue to cook over medium high heat until the mixture is quite thick. 3. Add the Parmesan cheese and mix until well blended. 1. Spread garlic sauce over the top of your pizza making sure you get to the edges. 2. Top with the cleaned shrimp. 3. Sprinkle the red pepper flakes over top of the shrimp. I used 1/4 teaspoon of the red pepper flakes, but you can use more or less according to your taste. 4. Top with mozzarella cheese. 5. Bake in a preheat 400 degree F oven for 18 to 20 minutes or until cheese is browned and crusted has turned a golden brown. I’ve not had shrimp on pizza but I now know I should give it a try…it sounds great. I love shrimp on pizza and I always add extra garlic, but never thought about changing out the sauce. Great idea.